A still from the Netflix series Ugly Delicious. 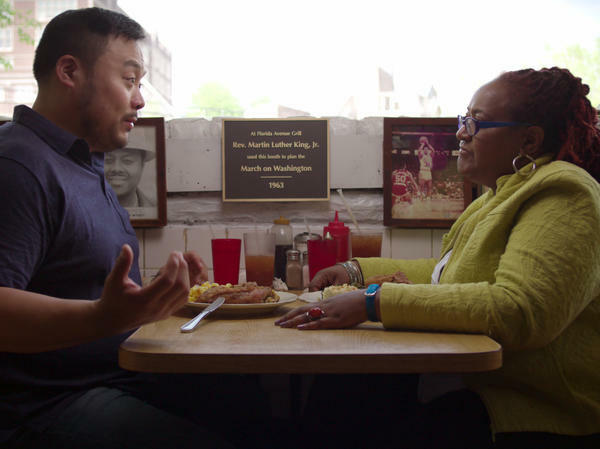 Chef David Chang's new Netflix show Ugly Delicious dives deep into how some of his favorite kinds of foods — from pizza to fried chicken — are made all over the world. Chang tells Here & Now's Jeremy Hobson the term that became the show's title originated as an Instagram hashtag, and an inside joke with his cooks. "The most delicious stuff is like a bowl of curry on rice, and that's not gonna inspire a cookbook or a cover of a Bon Appétit magazine," Chang says. "And all of this food [history] is sometimes not being told, and it's not being appreciated enough in the world we live in right now." Mark's one of my favorite, favorite chefs. There's there's just something romantic about watching Mark make pizza, because he uses a wine bottle instead of a traditional rolling pin. And even though he's just making pizzas, it's one of my favorite spots to go. But you get to hear their philosophy. It's not just a profile, and we're not even really talking about Mark. We're trying to get his understanding of what it's like to be an Italian-American — very quickly — and inheriting the sort of ... I don't wanna say the burden, but the responsibility of carrying on that tradition that came with all the Italian immigrants to New York City. We're trying to define what pizza is, how it came from, where do people think is the best pizza. ... I believe that the best pizza in the world for me — I can't speak for anyone else — is in Tokyo, and creating those conversations, or sometimes maybe the best pizza in the world, for me, is in New Haven. Which again, all of these things are talked about, written about, but trying to present it and cobbled together in a way that maybe the audience might not have heard. It really shows you that we're all making sort of the same thing. And what changes that are cultural beliefs, cultural biases. There's no universal truth about any food. Because we have so many beliefs and we have so many cultural truths, you're gonna have that variation in food, not just with ingredients. I mean, fried chicken is probably cooked the world around, all over, but it's a specific story for each person. What better way to represent history and culture than through food? And fried chicken is a perfect example of just how dense a subject can be. One of the reasons it's dense is, rarely do people wanna talk about the terrible hardships that fried chicken was born out of, and then presenting questions like, should you even talk about it? Should you even know the history of fried chicken to enjoy fried chicken? Because fried chicken in and of itself is delicious, and these are some of the conversations we're trying to have. That's pretty easy. Well, I'll say domestically it was the crawfish at Crawfish & Noodles in Houston, eating Viet-Cajun crawfish, which is a tremendous modern-day fusion that's happening before our very eyes. It's a merger of Vietnamese flavors and Cajun, which are very similar, believe it or not. "And internationally I would have to say it's the real-deal Peking duck in Beijing, cooked over jujube wood that's processed in a very special way that produces the most fabulous duck skin and juicy, juicy meat. That's a dish that I would travel to China just to eat. I really would. It's that good.